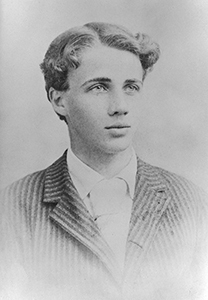 Born in San Francisco 139 years ago today, Robert Frost attended Dartmouth in the fall of 1892, the year this photo was taken. As a student, he spent a fair amount of time hiking along the Connecticut River and in the woods of Hanover, according to Frost scholar Jay Parini. Later in life, Frost recalled: “I was writing a good deal there [at Dartmouth]. I have ways of knowing that I was as much preoccupied with poetry then as now. ‘My Butterfly’ in ‘A Boy’s Will’ belongs to those days." Frost also said that he first thought of publishing poetry while at Dartmouth's Wilson Hall, which served as the library. There he read a poem by Richard Hovey, Class of 1885, that was printed in the publication The Independent. "That made a big impression on me," Frost recalled. "Here was a magazine I never heard of, but it had a whole front page of poetry." Referencing the Wilson Hall building, Frost went on to say, "That arch there, I always think that that's sort of a beginning for me of something that was going to happen that year." 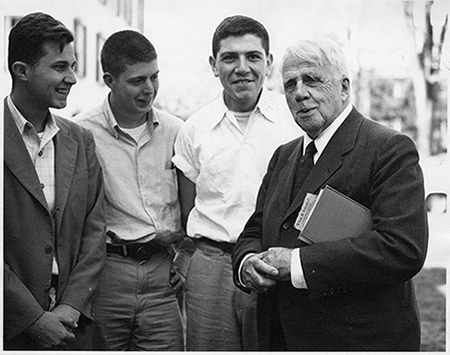 Frost with students in 1954. While Frost withdrew from the College after only a few months, he maintained a warm relationship with Dartmouth his entire life. He served as a Ticknor Fellow in the Humanities from 1943 to 1949, and he received two honorary degrees from two Dartmouth presidents. The Dartmouth College Library's Robert Frost Collection is one of the most significant in the world. A statue of Frost was erected on campus near Bartlett Tower in 1996.